Posted on November 2, 2016 at 15:59. A warning to all cyclists and pedestrians to please exercise caution when commuting on walkways/bike paths during ‘swooping season’. 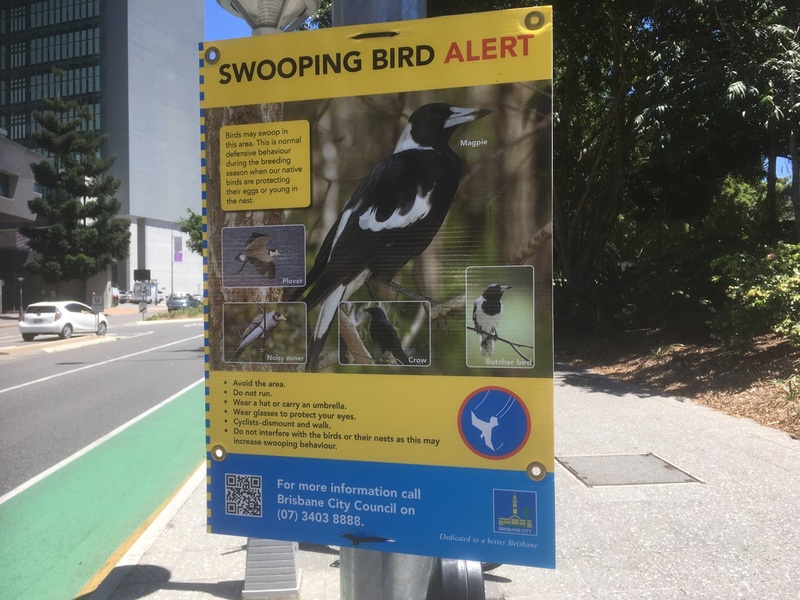 The following information has been retrieved from the Brisbane City Council website (https://www.brisbane.qld.gov.au/environment-waste/natural-environment/protecting-wildlife-brisbane/living-wildlife/swooping-birds) for the purpose of advising commuters how to avoid swooping areas and what action to take when faced with swooping birds. Between July and December some of Brisbane’s native bird species may become defensive and swoop people who venture too close to their nesting site. A small percentage of birds strike or swoop as a warning to ward off intruders from their territory. Territories may include your backyard, street, local park or school. This is normal defensive behaviour as the bird is trying to protect their eggs or newly hatched young in their nest. It usually lasts about six weeks. The most well-known bird for displaying swooping behaviour is the Australian magpie, however other species of native birds have also been known to swoop including the masked lapwing (plover), butcherbird, magpie-lark (pee-wee), little friarbird, torresian crow and noisy miner. do not touch a young bird. dismount and walk (it is believed the birds respond mainly to movement). undertake swooping bird assessments and implement appropriate responses on Council land (e.g. 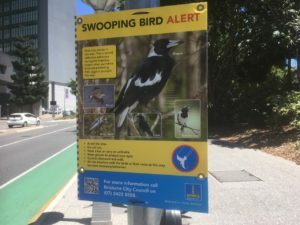 installing signage to warn people of swooping birds and installing covered bins to reduce access to artifical food sources).